This is — and isn’t — a story about gingerbread. 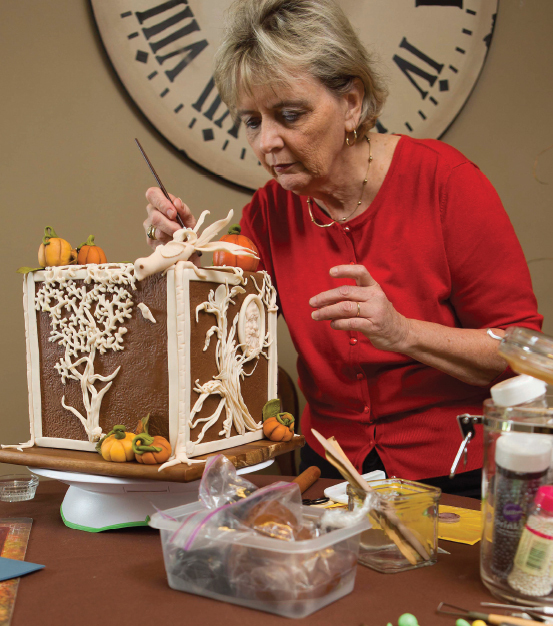 Yes, Ann Bailey is a gingerbread queen, with five top wins in national contests and her creative works described as “revolutionizing” within the sugar arts industry. But beyond that, this is a one-woman tale of persistence in chasing her dreams. That determination is what it took to claim gingerbread as her latest medium in a self-taught, artful career that’s included stints in all things design, from acrylics, pencils and graphics to interiors, visual merchandising and cake. Ann Bailey's creation Pawn Stars won her the grand prize at the 2014 Grove Park Inn’s National Gingerbread House Competition. Bailey spent more than two months building her first entry, in 2006, a gingerbread “bird condo” complete with 52 birds. She did not place, but learned a lot. The Grove Park Inn’s National Gingerbread House Competition, now in its 23rd year, sees 80 to 100 adult category entries per year, according to Tracey Johnston-Crum, director of Public Relations & Community Outreach for The Omni Grove Park Inn. Entries must be made of at least 75 percent gingerbread and of completely edible materials. They’re judged on overall appearance, originality and creativity, level of difficulty, precision and consistency of theme by a panel of food, arts and media professionals. In 2009 she won first place for her North Pole Library, complete with books sculpted of gingerbread, and was featured in a UNC-TV special. 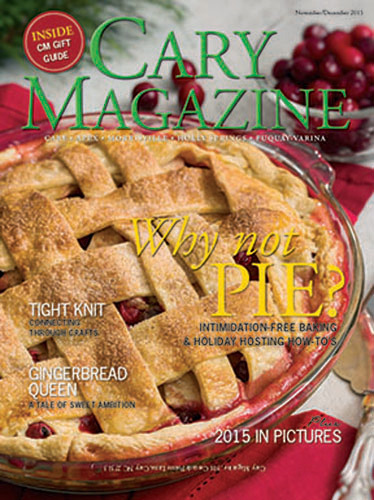 In 2011, she began judging the Town of Cary’s Gingerbread House Competition, part of the annual Heart of the Holidays Celebration. But Bailey still had her eye on that national grand prize. Researching previous years’ competition entries, she brainstormed and aimed for the win. So in her home kitchen, Bailey spent a year tweaking her secret gingerbread recipes and building techniques, swapping lard for butter and molasses for honey to develop “gingerbread gel,” a moldable air-dried dough that holds up to gingerbread’s enemy: humidity. She blended food coloring gels to create custom true-to-life earth tones, built prototypes of her project and shot test photos to catch details her eye might miss. At left is Bailey's Christmas With the Elves; at right is Three Wise Men, which won the 2012 grand prize in the National Gingerbread House Competition. The result of her efforts is titled Three Wise Men, a biblical scene featuring three 18-inch, almost-human figures in rippling robes, a camel with a delicate tasseled tail, multi-striped blanket, a rope seat and gilded pots, all beneath a “stone” archway. But just after Bailey had finished Three Wise Men, the sweet life took a sour turn when breast cancer hit in the fall of 2012. She took a deep breath and again drew from her determination and Christian faith to face the challenge. Just two weeks out of surgery, drainage tubes in her chest that no one else knew were there, Bailey accomplished her goal at the National Gingerbread House Competition. She won the grand prize. “It was an exciting atmosphere, with reporters wanting to interview us and cameras everywhere, from HGTV and The Travel Channel,” Bailey said. The win even landed her appearances on ABC’s Good Morning America, and The Chew with Chef Mario Bateli. Bowing out of competition in 2013 as she underwent chemo and radiation treatments, Bailey thought she’d focus her talents on cake design in 2014. She returned to the Grove Park Inn with a bang. Her highly detailed 32-piece set, dubbed Pawn Stars, features Santa as kings “of course,” impish elves as bishops, knights as reindeer with golden antlers, and rooks as whimsical Christmas trees with bulbous noses and toes peering from their foliage. Each individually attired, they perch atop a colorful painted chess board. Bailey transported the project to Asheville atop 5-inch thick foam pads banked with more foam and her suitcase. And again she earned the grand prize, a $7,500 package including cash, a stay at Grove Park Inn, and classes with Chef Nicholas Lodge of the International Sugar Art Collection school in Atlanta. At the center of Grove Park Inn’s famed Gingerbread Hall, Pawn Stars was displayed in a glass case until this November. Crum says the hall welcomes 75,000 visitors each year. Why? Because once Bailey achieves what she’s set out to do, she moves on. “I attempt things to the point of challenging myself to the ultimate, then I change course,” she said. “I’ve never done anything in life I’m this proud of — to uncover a talent that needed opportunity, to make a multitude of ‘gingerfriends,’ and learn how to be competitive. A Joyful Noise, one of Bailey's earlier gingerbread creations. When: Saturday, Dec. 5, 10 a.m. to 4 p.m.